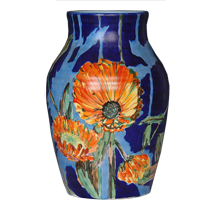 and works and includes the CCC Museum - growing to be the largest Clarice Cliff image source in the world. Read more about the benefits of joining ClariceCliff.com. Take the visitors museum tour. Become a member to gain full entry plus add your own collection! Our forum is full of interesting articles and discussions on all things Clarice. Come and join in! 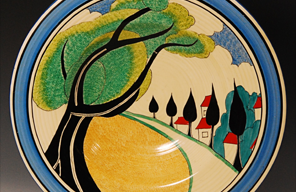 Members can contribute featured articles on Clarice Cliff to appear on the website. 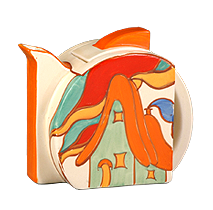 Clarice Cliff is, today, regarded as one of the most influential ceramics artists of the 20th Century and her work is collected, valued and admired the world over. She was born on January 20th 1899 in Tunstall, Stoke-on-Trent and started work at the age of 13 in 'The Potteries'. 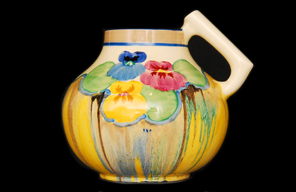 Clarice moved to the AJ Wilkinson's pottery factory in 1916. She was ambitious and her skills were recognised so that eventually she was given her own studio. 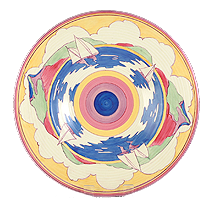 It was here that she starting creating her own patterns and the famous 'Bizarre' wares were launched in 1927. 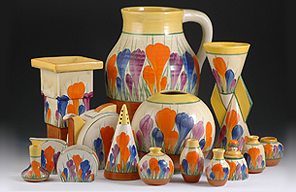 In 1928 Clarice created a pattern of Crocus flowers made from individual brushstrokes, completely hand-painted in bright colours. Orders came in thick and fast and in 1930 a separate decorating department was set up to meet demand. The vast majority of Clarice's 'Art Deco' output was between 1927 and 1936. 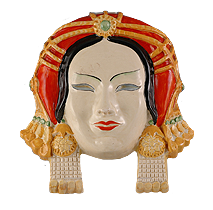 These years are commonly known, by collectors, as The 'Bizarre' years. After 'Bizarre' Clarice continued to produce many wares in her own unique style and to suit the current tastes of the nation and the various worldwide export markets.